I am very grateful to the lay preachers at Frenchgate Chapel in the nineteen sixties for being just about the worst advocates for their religion I can imagine. They not only failed to convince me, at about age 7, that I should believe in God. They failed to persuade me that they did either. Looking back at the age of fifty I realise what a lucky escape I had. I am not talking about escaping from some hideous fate. Child molesting clergy, while a lot more common than anyone realised were and are still pretty rare. But the horrific experience of a few is one thing. The not terrible, but nonetheless still rather poor experience of the majority is another. Thanks to the incompetence of the particular one I came into contact with, I didn’t appreciate just how effective most churches are at impressing their doctrines onto young minds. Knowing a bit more about the way the things work I can now better understand the misery it must cause. Trying to believe the unbelievable is hard work. And on top of that there is the guilt of failing to live up to the impossible demands Christianity places on its adherents. It may not be out and out child abuse, but what an unnecessary burden to place on young impressionable minds. When I was younger I imagined that I was just a natural skeptic immune to such things. Now I am not so sure. I just think I had a lucky escape from a lot of nonsense that could easily have distracted me from more useful stuff and would almost certainly have made me unhappy. I should thank my Dad too for buying a marvellous set of encyclopaedias. These included an illustrated Bible, but that was dull, dull, dull compared to the one devoted to science. That put me on the course to a reason based approach to life that has stood me in good stead ever since. I have even been lucky enough to be able to make a career out of it. But after a recent bad experience exposed to the full blast of someone’s religious zeal I thought it might be nice to lay back and bathe in eloquently expressed atheism for a while. So I gave it a spin and thoroughly enjoyed it. Hitchens is an aggressive debater and goes straight for the jugular. A few chapter headings give the flavour. Religion’s Corrupt beginnings. The Nightmare of the Old Testament. The “New” Testament Exceeds The Evil Of The “Old” One. You get the picture. 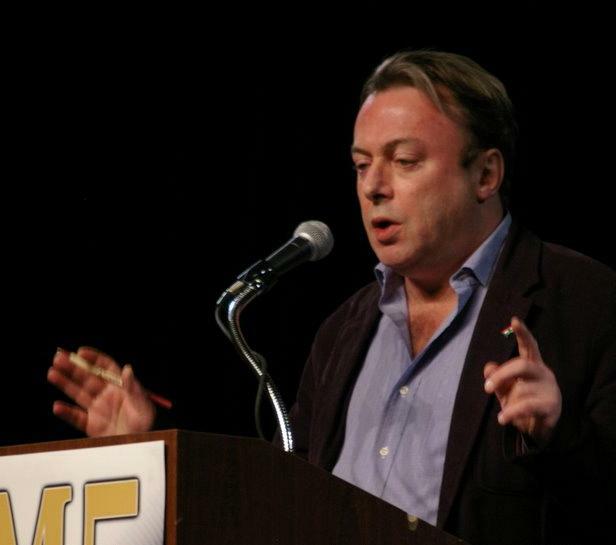 So what is Hitchen’s problem with religion? Well for a start it is manifestly false. He recalls being told as a child that God had made trees and grass green to be easy on the eye. Even the youthful Hitchens could see the glaring fallacy in that – obviously it is an adaptation and not a contrivance. False then, but is it nonetheless appealing? Not in the least. Who wants to spend all eternity worshipping an all powerful but somewhat insecure God who threatens you with eternal torment if you don’t. These are not beliefs worthy of respect. But false as it is, does it make people behave better? Hardly. For the willingness of the true believer to do the most unspeakable of deeds, even to their own children Hitchens recalls the story of Abraham and Isaac. Abraham had got as far as getting the knife ready for the deadly blow, and his willingness to go through with the grotesque sacrifice is held up as virtuous. This is just one example. In story after story the sheer mindless brutality of what has been done in the name of God is paraded. All faiths are guilty and all have been used to justify the worst behaviour that can be imagined. But surely examples like Hitler and Stalin show that the very worst behaviour comes with the atheist label. Hitchens demolishes this argument with the relish of Billy Bunter devouring a long awaited cake. Hitler was, as far as it is possible to tell, a practising Roman Catholic. He certainly wrote positively about Christian culture and specifically criticises atheists in Mein Kampf. He often portrays himself as the champion of Christian Europe defending it from the threat of the godless. If he was an atheist he expressed it in a very odd way. And even if he were he clearly and unambiguously used Christian imagery to mobilise people behind him. And the church was only to happy to work with him. Stalin was at least nominally an atheist. But even here it stretches it to describe the Soviet Union as an atheist state. Communism was a secular movement, but one that had quite a lot of idealogical baggage over and above disbelief in God. There was in any case an official church and state sponsored theological colleges. The details are interesting. It arms you well for your next discussion of this issue down the pub. I particularly like his knock out blow. Religion has clearly fallen from its claim to moral pre-emminence if all it can offer is being better than fascist and communist dictators. Moral authority, as Shakespeare might have put it, should be made of sterner stuff. Up to this point the book had been good knockabout stuff. But as I had feared, I hadn’t really learnt anything new that challenged what I already thought. While entertaining, the tone of the book had been resolutely negative. But towards the end Hitchens starts to look not at the follies and excesses of the believers, but at the courage of the non-believers. This starts in a curious place – something that seems at first sight to be a tiny insignificant detail of history. At around Christmas the Jews celebrate the festival of hanukkah. The significance of this particular date on the Jewish calendar has been played up in modern times by Jews living among predominantly Christian populations as it is handy to be able to fit in with everyone else’s celebrations. Fair enough, and why not. It can’t be much fun missing out on a party. But the origins of this convenient excuse to join in are more interesting than you might think. It marks events in the third century BC. There was a struggle between Jews who had become hellenised and those that wanted to stick to traditional cultural practises. The leaders of the traditionalists were the Macabees, who defeated their opponents so completely that it was quite a surprise to me to find that there had ever been Hellenistic Jews in the first place. The seven armed candle stick that is associated with the festival of Hannakah relates to a miracle that occured when the temple was reconsecrated after its pollution by another faction. They only had one day’s supply of oil, but this somehow managed to last the full eight days required by the protocol. A fairly modest miracle by the standards of most faiths. It is hardly parting the Red Sea. But the real miracle is that the tight control of relgious practice by the orthodox established at this point survived for so many centuries, and even persists in some small religious groups in Israel to this day. Hitchens is in despair. If only the zealots had not won then, we would not have had Christianity or Islam. Rather than a yawning chasm between us and the rationalists of the Classical Age, Europe might have developed continuously building on the foundations of Greek learning. There would have been no need for a Renaissance because the ancient knowledge would never have been lost in the first place. Human progress could have been brought forward by 1500 years. I imagine a Jewish reader might be beginning to get a bit alarmed here. The Catholic Church has not long ceased blaming the Jews for the murder of Christ. Is Hitchens now trying to pin the Dark Ages on them? Well he clearly isn’t anti-semetic. He goes on to give an impressive inventory of Jewish achievements – all of which were the result of throwing off the shackles imposed by orthodox judaism. Hearing praise lavished on a group you are not a member of is often tiresome, but as always it is well written and hard to argue against. One of the earliest Jews to whom we should be grateful is Spinoza. Spinoza is one of the first people who we can be sure really was an atheist. Or at least so scholars tell us. I had a go at reading Spinoza and I couldn’t make head or tail of it – but apparently the meaning of what he was up to was very clear to his contemporaries. Spinoza was banished from his Jewish community in Amsterdam and was not able to publish his work in his own lifetime. We get to read the wording of the anathema against him, and scary stuff it is. It is so easy to forget in our modern world where one can express any opinion one likes without fear, that to be an atheist was a dangerous business in a world where the Church had real influence. I have to say this is not a subject that had ever really crossed my mind before. Faith has been steadily declining for the last five hundred years. But it has always seemed to me to be a simple natural process rather like an abandoned building slowly decaying. But this is very condescending of me. Why shouldn’t skeptics be found in any age. Indeed there is a psalm that expressly scorns unbelievers. Why would they be mentioned if they didn’t exist. It is easy to see why they would keep their views to themselves. To question the religious authorities was quite likely to get you killed. And there isn’t much benefit to becoming a martyr for an atheist – you are hardly going to get rewarded for it in a next life. God is not Great really comes alive in the last couple of chapters where we look at the courage of people who proposed a more rational and enightened view of the world. Spinoza was the start of a stream that would become a flood, but at every stage there was risk. Voltaire, Hume, and even someone as late as Darwin are all praised for being willing to stick their necks out. Even after the religious lost the power to actually kill or punish people they didn’t like, they continued to do their best to distort the memory of more enlightened thinkers. The imaginary deathbed recantations of Voltaire and Darwin are good examples, and continue to get wide publicity in some places. Einstein, who Hitchens memorably and unanswerably points out deserves more thanks from mankind than every rabbi that ever lived, got this treatment while he was still alive. Neither Hitchens, nor I, can better the great man himself’s own words on the matter. The willingness of some people to break the commandment about bearing false witness in order to claim a non-believer into the fold against their will is a fairly mild crime compared to many that have been carried out in the name of religion and documented in detail in this book. But sometimes it is the petty and banal things that rankle the most. It is hard to believe someone dishonest enough to pull that kind of stunt actually believes in the existence of an all knowing all judging God – maybe my 7 year old self had already grasped one of the essential truths about religion. A lot of people involved in it quite actively are nonetheless not that firm in their actual belief. If you are religious, don’t read this book. You won’t enjoy it. It is of course a polemic. Grudging references are made to some good things done by the religious, but it is not intended to be a balanced weighing up of the evidence. The good that that faithful do is always suspect. Are they truly worthy people or are they simply trying to gain the favour of their imaginary friend? But nonetheless, the best response to criticism is to live a good and honourable life and to act in accordance with your principles. There have been some religious figures who command the respect even of an atheist like me. I would also warn atheists to be careful when reading it too. It is very entertaining to revel in the shortcomings of others, but it isn’t necessarily helpful. That religion attracts hucksters and frauds is not really a revelation, and it is something that only the most dewy eyed idealistic believer is not already well aware of. The contradictions and lack of logic of their faith are also reasonably apparent to most believers. They have managed to cope with them. Most believers don’t feel personally responsible for everything done in the name of their particular demonination. The people they meet in their congregations are not monsters, not at first sight at any rate. God is not Great is much too wide in scope to dent the beliefs of any particular person. And this is the weakness of God is not Great. Most people are not that attached to their particular faith. They pick and choose what they want to believe from it. Some reject more than they accept. They don’t regard themseleves as part of a block of believers. The representitives of their faith they meet in person are not thorougly evil men like Torquemada or Pope Benedict. The atheists they know aren’t Einstein or Spinoza either. The polemics against the evils or religion, no matter how well founded, simply don’t resonate at an everyday level. Somebody should tackle the subject from the other side. I can even offer a working title. God is not only not great, but boy does he make Sundays boring and do you really need someone to tell you right from wrong at your age? In the meantime, God is not Great is a good read and very educational. I don’t think you will find yourself giving up half way through, but if you are short of time the last two chapters are the best.